While the Democratic candidate, Patrick Murphy, declared victory last week in the close contest, West has yet to concede, citing the razor thin margin between the two. On Friday, West's campaign said that while they "respect the court's decision, we remain concerned the voters in St. Lucie County will not be able to have confidence in the integrity of the electoral process and their right to a fair election, and will continue to pursue all legal options to ensure they do." "It became apparent today that Patrick Murphy has no interest in having a fair and accurate count of votes," the campaign continued. "We are dismayed that a man who clearly has no respect for the law suddenly wants to lecture others about it. Regarding the "rule of law," the fact that the St. Lucie County Supervisor of Elections did not follow it is part of the reason we have found so many discrepancies with the votes." West, a first term Republican congressman and retired Army lieutenant colonel, and Patrick were locked in one of the country's most expensive races for a U.S. House seat, according to a ranking prepared by the Center for Responsive Politics. West raised $17 million through mid-October and Murphy brought in $3.7 million, according for Federal Election Commission records. On Friday, the website of Florida's secretary of state indicated Murphy had a roughly 1,900-vote lead over West out of 330,594 total ballots cast. The .58% margin falls outside of the .5% less margin needed for an automatic recount. The votes are considered unofficial until November 20, when election officials have said the results will be certified. But West's campaign argues the certification date should be postponed until all the early ballots are counted. – CNN's Ashley Killough, Gregory Wallace, Kevin Bohn, and Robert Yoon contributed to this report. Good grief. How many recounts can there be? Oh wait, this is Florida. GORE IN 2000!!! Al Gore, thou art avenged. Go to hell Uncle Allen! Y'know, this could all be made ever so much simpler if we had a definition of "TIE" – in otehr words, when the results are clsoer than the margin of error. Then we could just FLIP A DAMN COIN and BE DONE WITH IT. What a petulant bitter little man. It's over dude – you lost! Why do you Tea Party Jerks have so much touble understanding math? It's over. I don't live in Florida, but from what I'm reading, you're not wanted as a representative of those people. Quit wasting tax payers' money (afterall isn't that what the Tea Party is all about – Fiscal Coservatism?) and let it go. The show is over. Please exit by the back door . . .
West is probably another victim of the election fraud that the dems say doesn't happen. Entire districts in Ohio, Philadelphia and Pennsylvania with 0 votes for Romney, not one. Things that make you go....hmmmmmmm. One, maybe, but 59 in Pennsylvania alone???? Yeah right. I hate to see grown men who act like five year olds. Would think That Mr. West would take the hint, you lost, get over yourself and find a job the people of your district feel you can handle. 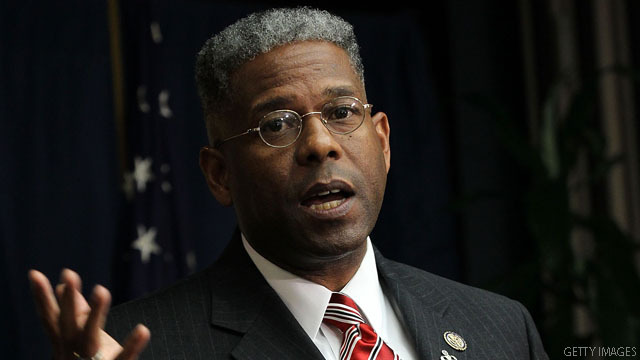 Go, Allen West!! Keep on fighting!!! The Republican party doesn't even want him ! Republican sore losers must be contagious. West should apply to be the new face on the box of Uncle Ben's Rice. The only bad thing is I wouldn't buy it anymore. And don't let the door hit ya where the good Lord split ya. Both Allen West and Karl Rove look and act like two ducks that have just been hit on their heads. One of them, I'll bet, continues to sit in front of the turned-off FoxNews cameras babbling aimlessly about Romney not yet losing Ohio. Can't anyone over there at FoxNews call the looney-van and get him some needed medical attention? While the other sits in his office in FLA surrounded by his multi-moillion dollar trial lawyers, as he continues to deleriously map out how he and his activist 'conservative' judges can disenfranchise enough Americans to manipulate a win for him....even as his million-dollar yes-men sit around shaking-off the slack-jaw drool he lathers them with, as they count the [R] campaign money flowing effortlessly into their deep pockets. lol Everyone is teabagging the teaparty members, its hilarious, I wouldn't even be surprised to see the RNC chipping in money in this past election to make sure teaparty is a way of the past. Another example of reality hitting a republican in the face and that person being unable to comprehend that reality. Leave, West. The voters have spoken and they fired you. well if democrats are fighting a recount in a close election like this it can only be because there is obvious voter or election fraud going on. what would an honest person have to hide?